Currently I have a surplus of cucumbers - I picked eight today, and will probably have another pile in a couple of days. Luckily there is good old google to turn to, when one is looking for ways to use them, without resorting to pickle. I pinned a few recipes to try. Tonight was Lemon Cucumber Salad using cucumber (obviously), radish and parsley from my garden. Unfortunately it will be another couple of month before I have capsicums ready to eat. On such a warm evening, this was a really cool refreshing salad to eat. Does anyone know what the silvery marks on the skin are? What are your favourite cucumber recipes? a large fabric bowl, for all her fabric scraps. Now this is a big bowl, at least 8 or 9" high ( yes I forgot to take note of the dimensions when I made it) I used the pattern from Nova as a basis and just made my own size. The paper pieced word comes from here. Lots of bright cheery fabrics for this. A Sew Together Bag - lots of scraps including Bonnie & Camille, Heather Bailey and Carolyn Friedlander. The inside is lined with a fabric from Heather Bailey's Up Parasol range, and inside pockets in a minty dot. Finally a pouch for my Mum - she is travelling to Europe next year, and wanted a pouch to put in her day bag. I had the perfect lining fabric and then filled the pouch with some little goodies for travellers, like ear plugs, lip balm, hand cream, tissues etc. What did you make for Christmas gifts? I am going to have a little break from my blog over Christmas and New Year. Thank you to everyone who has read, commented and shared my ramblings this year, I so wish I could meet you in real life. Sharing some more photos of New Zealand's beautiful native Christmas tree - the Pohutukawa. These are from the trees, all flowering up my street at present. Wishing you all a safe and Merry Christmas and New Year. The Last Minute Christmas Sampler QAL is almost finished. Julianna has released all 12 patterns, and so far I have made 10 of them. Her last two are a little more detailed, and require a lot more concentration and effort than I felt like putting into sewing today. My mission today, was to start quilting these blocks and turning them into place mats. I have trimmed them all down to 11.5" squares, and they will all be backed in the white and red star/snowflake print in the top photo. Quilting is straight lines approximately 1/2" inch apart, and the binding is a slightly marbled red. So far one has been completed, I had grand visions of getting them done, so we would be able to use them on Christmas Day, but maybe I'll make that Christmas 2015. I have had a lot of fun making these blocks, some have definitely challenged me at times, but the result has been worth it. Thanks for such a fun project Julianna. Linking up to WIP Wednesday at Freshly Pieced and the QAL Linky party at Sewing Under Rainbow. Lately I have read some wonderful books, some of which, have been written in the form of letters between two or more of the main characters. After hearing me recommending the two above to a customer, one of my co-workers told me they are called epistolary novels. I did a bit of searching and requesting through the Auckland Libraries catalogue and found a few more which I have yet to read, but am looking forward to now I am on holiday. 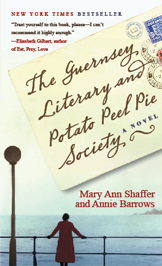 Good reads also has a list of popular epistolary novels too if you are wanting try something new for the holidays. The top photo is what my sister received from me, and the little bag I made for it all. I forgot to photograph the ornament, and the next photo is what I received. Finally I also received three months worth of my Liberty subscription, I am getting a nice little stash of these now. Hoping you all have a wonderful week ahead, especially to everyone who has children finishing school this week. 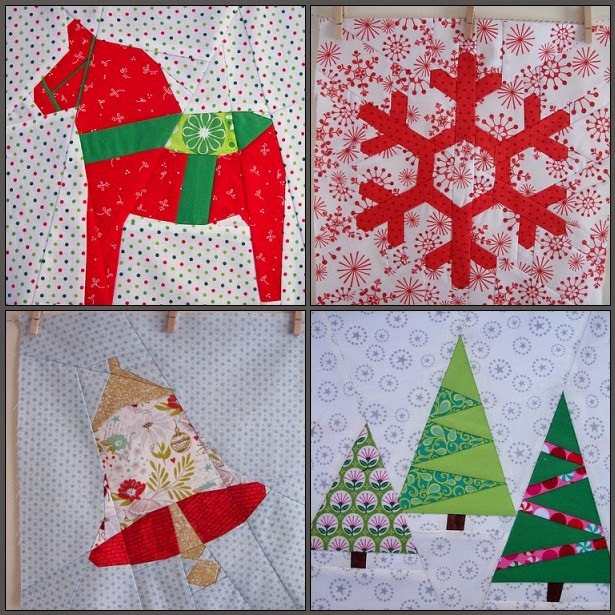 I am still plodding along with my Last Minute Christmas Sampler QAL blocks. block 8 - Candles, Julianna actually gave us two versions of the pattern, I opted for the advanced with all the fussy cut piecing around the flame. block 9 - Reindeer - there were a lot of pieces to put together in this block. Luckily I had the perfect backing fabric to use for it. block 10 - Nutcracker - I debated long and hard over my fabric choices for the nutcracker. In the end, I pulled one of our nutcracker decorations off the tree and used it as inspiration. I made a couple of changes to the pattern namely omitting the candy cane, and utilised some fussy cut pieces of fabric for the jacket front and belt. My son has said that I have made it in the colours of the Chiefs rugby team . Luckily I am up to date now, ready for the next pattern to be released tonight, though I am not sure how much sewing I will get done this weekend. My sister and her family arrive from Brisbane on Saturday night, and she and I have a day out together on Sunday. it is starting to look like Christmas at my house - the tree has gone up, and been decorated by Miss B and Mr J.
the dancing shoes came out on Saturday night, along with the little black dress. The Scout had his Christmas party for work, lots of nice wine, good food and dancing. I think I am getting to old for getting home at 1.00 am though. my Cosmos are starting to flower - may this be the first of many. I have also planted some zinnias too. some easy Christmas sewing - a little gift bag from the excellent tutorial from Svetlana. Wishing you all a fabulous week. When I was at my sewing day on Sunday, Deb showed us the great tote bag she received in a swap. It is the Winslow Market Tote, and because it is not quilted, just interfaced it can roll up when not in use. It was surprisingly roomy and because I was only using a paper shopping bag, (admittedly a very nice one) when travelling with all my sewing supplies, I thought I needed to make myself one. After a lot of deliberating over fabric combinations, I chose a mix of Tula Pink's Moonshine, some Julianna Horner, Cotton & Steel and a red check from DS fabrics for the lining. Shopping the stash here. I even had thread in all the right colours too, and just enough interfacing. All was going well, until it came to attaching the base to the front and back bag panels. Help - I was two inches short. Somehow I had cut my base to 18" not 19", and then to make matters worse, I missed the vital instruction that all seam allowances were 1/2" not 1/4 ". So after some remedial cutting, and patching, I have nearly made a bag, based on the pattern, but with some unique design features of my own. Now there is just the lining to make, some corners to trim, the putting it all together and finishing off with some top stitching. That might be the weekend's job. I am also still working on my pieces for the Last Minute Christmas Sampler QAL, so far four blocks have been completed, number five will, hopefully be started tonight. lots of little blocks ready to be turned into a snowflake block, for my last Minute Christmas Sampler QAL, which I must get done, cos block 4 has been just been released. The Two Knights pillow is finished. Binding was stitched down at a very productive (for a change) sewing day with Rachel, Deb and another new friend called Rachael. Hope you all have a fabulous week.